We are all on WhatsApp. Maybe not all but at least 1.5 billion of us as of Q4 2017. It’s a popular mobile app but did you know that you can access Whatsapp on your computer via a feature called WhatsApp Web. But the way you authenticate yourself is slightly different but very easy. No Email ID, username, or password. You only need to scan a QR Code on your computer (know as Whatsapp Web QR Code) using WhatsApp on your smartphone. Firstly, a QR Code is a 2D barcode that can store information just like a barcode. You can think of it as an advanced form of a barcode. QR Codes are very popular in mobile payments and are used by WeChat, Paytm, BHIM App, Mobikwik, and many other mobile payment platforms. A QR Code can be scanned and decoded using an application on your smartphone. Just like these payment apps, WhatsApp uses QR Codes to authenticate its subscribers and provide access to WhatsApp chats on your computer. 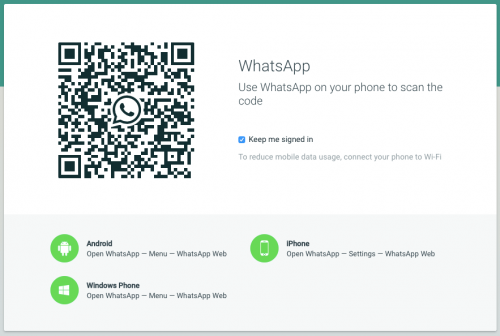 You can read the next section to know more about QR Code authentication or skip directly to How to Access WhatsApp Chats on PC. When you first created a WhatsApp account, you only registered your phone number and verified it with an OTP. You do not have a login or password. So how do you access Whatsapp on PC? How does WhatsApp verify that it’s you and shows you the right chats. It does this by using the logged in WhatsApp app on your smartphone. Your phone is your password. You can use it to login to Whatsapp Web on your PC. 1. Go to web.whatsapp.com on your computer browser or download the Whatsapp Web desktop application for your PC/Mac. 2. On the main screen, you will see a QR Code. This QR Code is dynamic in nature and will change every few seconds. 3. Open WhatsApp on your smartphone. Note that WhatsApp is now only available in iPhones, Android-based smartphones, and Windows phones. 5. From this screen click on the ‘+’ sign on the top right corner to open the scanner. In iPhones, the scanner will launch automatically. 6. Using this Scanner, scan the WhatsApp Web QR Code on your browser screen or desktop app to complete the authentication process. Now you will be able to view your chats. Note that you will need to keep your phone on and connected to the internet for WhatsApp Web to work. The phone acts as a server and if you switch it off or disconnect mobile internet, you will not be able to view your chats on Whatsapp Web. 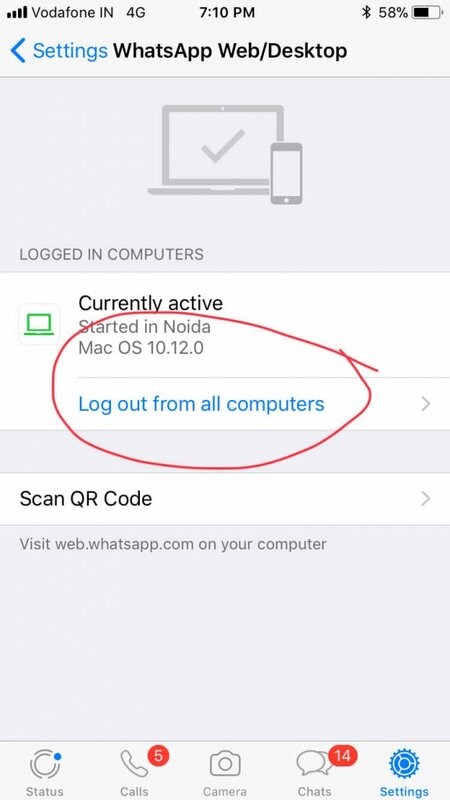 To log out, simply go to the WhatsApp Web section on your WhatsApp app and click on ‘Log out of all computers’. This will ensure that you are not logged into any PC. While using a QR Code has made it easy to access Whatsapp on PC, it is also made users vulnerable to hacks. Anyone who has access to your phone even for a few seconds, can view your chats on their PC or even mobile device. If your partner or parent or friends have the Whatscan App Messenger,on their smartphone, they are probably spying on your WhatsApp chats. Here is the app for iPhone. The Google Play Store seems to have removed the Whatscan app. However, Android users can still download the APK file from multiple APK sites. To ensure that no-one is spying on your chats, regularly visit the Whatsapp Web section on your phone and hit ‘Log out of all computers’. This will ensure that your WhatsApp is logged out and everyone will need to scan the QR Code again using your phone. 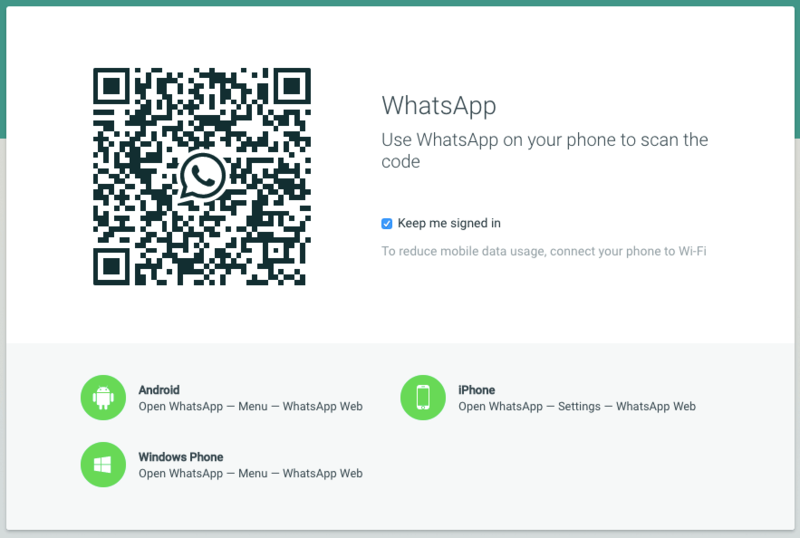 Just like the WhatScan app, anyone can also scan the Whatsapp Web QR Code on a computer screen if they have access to your phone for a few minutes. They don’t even need to download an app. See the video below to secure yourself from Whatsapp hacks by friends and family members. You are all set to use WhatsApp Web. 1. WhatsApp Group QR Codes: As one scans a WhatsApp Group QR Code, it helps her join a WhatsApp group. And one can even revoke this QR Code to stop unwanted people from joining the group. 2. 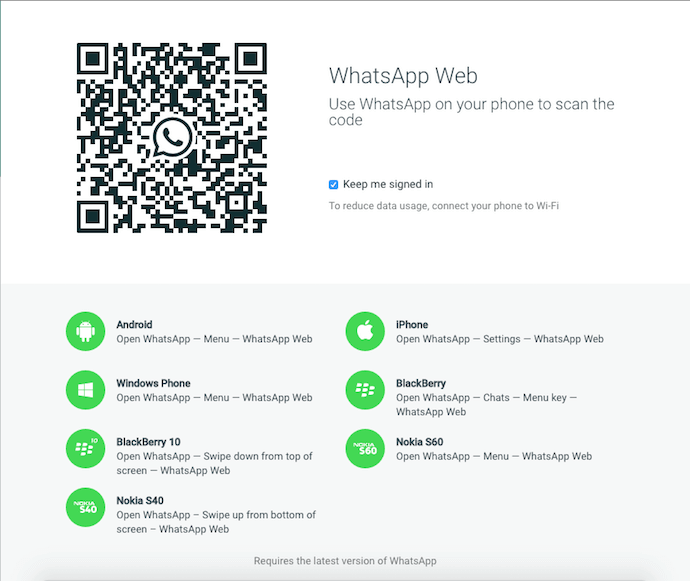 WhatsApp QR Code: In Nov 2018, WABetainfo—a website that monitors WhatsApp updates—spotted these QR Codes under development. They’ll allow users add contacts with a simple scan of QR Codes. That’s all you need to know about WhatsApp Web QR Code. Hi Arvind. Do you have a question related to Whatsapp Web QR Code? Let us know. My whatsapp scanner is not able to scan the QR code even when my Whatsapp and Google chrome are updated! Any leads? If I forgot to logout in another device & m move on…so what I can do….??? If you used Whatsapp Web on a computer by scanning a QR Code and you forgot to log out, here is what you can do—Open Whatsapp on your smartphone device and go to Settings > Whatsapp Web. Here you will see an option to ‘Log out of all computers’. Click on this and you’ll be logged out of all computers where you signed into Whatsapp Web. Please add my mail. I am Anil Menon from kerala. mail: [email protected]. I want to ask something in private mail me. topics to how to use QR code in whatsapp and make use of it to hack. Wifi cannot see the we code on my browser? I use chrome and new Lenova tab4. Hey scanovatech how you doing? If i change whatsapp from present phone to other, then also its work or not on my other phone? Sir i have scan my friend whattup..but sir when hi unintrall whatsup there..how can i connected with..automatically i concted them..pls sir teell me..how can solution..i have not meet very long time his but i have conncted with my friend whttup..
contact me, email on my profile. I scan the QR code but for some reason I don’t see the chat from the other phone any more, and they haven’t log out, can I recover it without having to scan it again? Thank you so much. How can we share the phone location from whatsapp web? I installed whatscan on my smartphone n it was working very well but without knowingly i had logged out it but can i get back that conversations if yes how ?? I want to know where is located the pictures and video that I receive through whatsapp in my computer? Because on my phone is located in Gallery and I know that when you receive the picture , it ist permanently saved, but where? Can some attack my whatsapp account by using in PC? All things I’m sharing are also privat? Unlike your phone, Whatsapp Web does not automatically download the photos/videos in your PC. But you can access it the media via Whatsapp Web. Go to a Chat where you received the photo. Click on the person/group’s name. The person’s/group’s contact info will open and you will get a ‘Media’ option. Open this and you will be able to see all media received in this chat. You can then download the photos/videos you need. 1. Open a mobile browser on Mob B. 2. Go to http://web.whatsapp.com on Mob B. Hope this was helpful. Note: Please not use this method to view private data of others. It is a federal offence to do so. If I’m on Whatsapp on my computer can you still see that I’m online on my iPhone? Yes. If you are active on Whatsapp Web, your friends will see your status as ‘online’ even if you are not using your phone. Hello Scanovatech Why is it so! Because you are active on Whatsapp Web. Whatsapp Web is nothing but another window to the Whatsapp app on your phone. Let me know if you meant something else. If you click on ‘Log out of all computers’ using your Whatsapp app, your friend will stop seeing all messages and photos. Note that if he has downloaded the photos or taken screenshots of the chats, there is nothing you can do about it. If you use Whatsapp Web again, only the computer where you scan the QR Code will show your chats. Your friend will not have access to these chats again. For your own data security, I recommend not sharing your unlocked phone to friends and family members. If you have to, please check status in Whatsapp Web section and click ‘Log out of all computers’. If you do not have Whatsapp on your phone, you cannot use it on a computer. Yes. Doesn’t matter where the phone is as long as it is on, connected to the internet, and the owner hasn’t ‘Log out of all computers’. Disclaimer: We do not encourage spying on other people’s personal data. It is a federal offence. I scanned the code and get the chat and conversations bt now i want to keep another account in the pc..so I went to the whatsapp web from my phone and did log out from all computer devices..its okk..bt now i m not getting the qr code again in my pc..so how can I open a different account in my pc using qr code which is on my other phone? ?please help me..and help me also about it that after open the account on pc in the browser could I use it without opening in the browser? ?I mean could I cannot use the account in an app??? You can try clearing cache from your browser or opening Whatsapp Web on a different browser (Safari, Firefox, etc.). I have noticed that there is a PC logged into my whatsapp but I have never used whatsapp web. I tried logging out through my phone but the PC still has access after a day or 2. It is possible that someone has regular access to your phone and has logged in again even after you logged out. I can access the what’s app at the beginning and I closed it, now again I want to access the same whatsapp. Can I access it again without scan the code? Yes if you haven’t used the ‘Log out of all Computers’ option from your Whatsapp app then you should still be logged in. Just go to http://web.whatsapp.com from the same browser. I am working on startup idea. i want to discuss something about QR code. One of my friend anonymously scanned my whatsapp qr code frm my iphone and he got access to my whatsapp acount but i removed his access frm my phone … Can u plz tell that after removing his access frm my phone , he cant access it again?? If you used the option ‘Log out of all computers’ from your Whatsapp app, then your friend will not be able to access your chats until he gains access to your phone again. Hi, I’,m using Whatsapp Web and Whatsapp Panel on Mozilla and doesn’t seem to be a way to keep me logged in. I checked the “Keep me logged in” box every time and yet every time I use both the page or the add-on, I have to rescan the QR code. Why is this happening? Is there something else I’m missing? Uhmmm I have 1 Q I battle now for 2 m now to get my whatsapp back on my pc ! I press the wrong button I press Log out off all computers is there a way to get it back on my pc it don’t want to scan the QR Code on my pc I battle also to get whatsupp back on my Alcatel phone bat i got it to work again ! Must I do any settings on my phone or pc to get it work again ? Can anyone help me pls ? Hello i have a 2 question.. Question number 1: I scan the code.. In this moment i am using whatapp web.. And I would like to know how much time is available the code? Is gonna work till I will log out from my computer? Or at 2months you have to repeat the proces again? Question number 2.. If the phone that I’ve scanned the code is switching the whatapp account for 1h and using other number.. What will be the message that I will receive on my computer? That the phone has no internet connection or will be log out directly and ask me to scan the code again? Question 1: If you have logged into Whatsapp Web using your Whatsapp app, then you will be logged in till you log out. 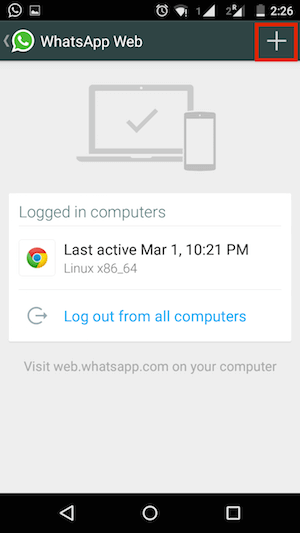 Logging out is possible either using your Whatsapp app or if you clear your browser cache/cookies. I don’t think there is a fixed period when you will be automatically logged out. Question 2: If you switch the phone number on your Whatsapp app, I think you will be logged out of all computers. You will need to scan again to get messages of the new number Whatsapp. if someone scan my whatsapp QR code from another device then what will be happen..?? is that they get my all details or what..??? or they can access my app..?? my query is that when all the situation for smartphone becomes identical and if two smartphones are scanning together then, what wii happened and what actions should whatsapp take? Thanks for your clear explaination. Nice writing ! I learned a lot from the analysis ! Does anyone know if my assistant might be able to obtain a blank NYC RPIE-2010 Instruction copy to edit ? Hi. I installed Whatsapp web on my pc. All works well only i can just chat. Dont see any way to call. Am i missing something? Thanks! I’m unable to scan the QR code. Once I accept the “OK, I understand” label to start scanning, screen turns black, and the phone restarts. It’s a clean installation of today. Other scanning app crashes trying to read a QR, but “Barcode Scanner” from Zxing runs, and I’m capable of reading QR/barcodes. I tried to double tap outside the warning, but nothing happens. The phone is rooted. With other ROM I had no problem, so it’s not matter of the camera. Zxing recognizes the Whatsapp QR, but it’s useless to authorise the PC to use Whatsapp Web. I’m stuck there. Thanks! my phone scans selfie only. What to do? 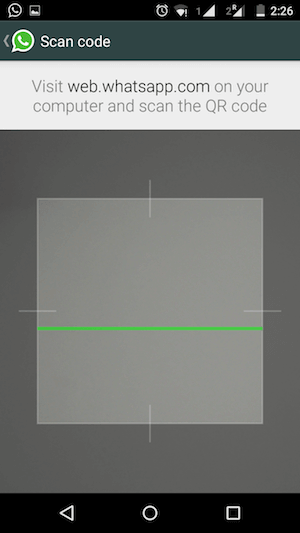 If your back camera is faulty, then you will need to get it fixed. I don’t think Whatsapp supports scanning via front camera. have to rescan the QR code again and again ! its really a boring process. keep me connected without the need to rescan the code every day??? are the reasons for disconnection ? are the solutions to prevent that ? this related ? and how can I avoid this occurrence ? ive been using whatsapp on other android phone , but it keeps disconnecting ( though im putting the tick on keep me logging), and every time I have to rescan the QR code again and again ! its really a boring process. is there any advice to keep me connected without the need to rescan the code everyday??? what are the reasons to that , so I can avoid ? Just a small query , if i change my smartphone. (contact no is same), do i rescan the qr from the new device or it still works??? In all likelihood, you will need to rescan the QR Code. This is because your phone acts as the server for Whatsapp Web data. I accessed Whatsapp Web on a computer at a relative’s house yesterday. Now, I’m not aware whether he logged out or not, I had to go somewhere. I need to be sure that he has indeed logged out and is not snooping around. I use an iPhone. Anyway I can ensure he has logged out, or can I log my ID out of the PC using my iPhone? Yes you can log out of Whatsapp Web from your iPhone. 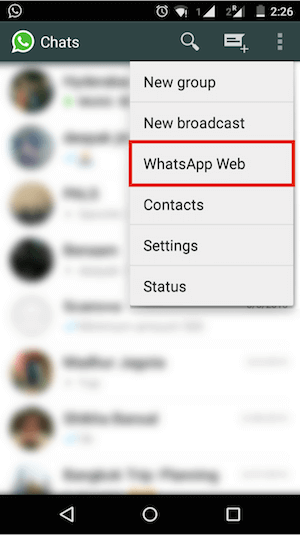 Open Whatsapp > Settings > Whatsapp Web. You will see an option to log out of all computers. 1. Ask a friend or family member to scan the QR Code on http://web.whatsapp.com on your laptop using their Whatsapp app. If they are able to, then the issue is with your device. It could be a camera problem which cannot decode the QR Code. I believe Whatsapp Calling is not yet supported on Whatsapp Web. This could be because all data is transferred via your phone to Whatsapp Web over internet. While transferring chat data (small data size) might be a seamless experience, same cannot be said for transferring voice data (large data size). then any other way out ? You can look for hacks or third-party applications that do this. I am not aware of any though. On your Whatsapp app on your device, go to Settings. Then go to Whatsapp Web. You will be able to see the list of computers you are logged into. I have Gionee E7… although i was able to access whatsapp previously… the second time around it doesnt work…. the QR reader does not seem to read the code. It just stays static zooming in and out at the QR code. I tried reinstalling whatsapp but the same problem persists. Any ideas?! The issue could be with your camera. Try scanning any other QR Code and see if your device is able to scan a QR Code or not. You can create a test QR Code using https://scanova.io/ and you will need a generic QR Code scanning application (i-nigma, QR Code Reader by Scan). @scanovatech : My whatsapp scanner is not able to scan the QR code even when my Whatsapp and Google chrome are updated! Any leads? It’s happening with me also.Did you find any solution for this ? If you’re not able to, then this probably means that its a hardware defect rather than an issue with Chrome or Whatsapp. yes sir u r right some one scanned my QR code on whatsapp web on their pc using my phone. is there any solution to this problem as i already unistall watsapp plaese tell me the solution to this problem. I would suggest to install your Whatsapp app again on your phone and check in the Whatsapp Web section in the app if there are active computers using your Whatsapp. If there are, use the ‘Log out from our computers’ button to not allow any computer to view your chats. Once you have done that, you can freely use Whatsapp App on your phone. Nobody else will be able to access your chats on any PC until they can scan again. I am using samsung galaxy grand prime plase ensure me at the earliest how to get from this problem as i am unable to use whatsapp since 20 days because of security reasons as some one has copied my QR code and he is creating a big problem for me. Copying the QR Code of Whatsapp Web will not help anyone as it is valid for only a few seconds and is independent of your Whatsapp account. If someone scanned a QR Code on Whatsapp Web on their PC using your phone then they will be able to see your chats and send/received your messages using that PC. To revoke access from their PC, you can log out from within your Whatsapp app on your phone. On your Samsung Galaxy Grand Prime, open Whatsapp. Click on the three dots icon on the top right corner and click on Whatsapp Web option. Now simply, click on ‘Log out from all Computers’ on the page that loads. On this page, you will also see history of activity. I don’t have a working camera in my phone, can i open whats app web in any other form??? Please help! I am assuming that your camera is not working because if your phone doesn’t have a camera then Whatsapp Web is not supported at all for your device. Unfortunately, if you don’t have a working camera then it won’t be possible to for you scan the Whatsapp Web QR Code from your device and use Whatsapp Web. You will have to get a device from the list of supported devices mentioned in the second half of this page: https://web.whatsapp.com/ with a working camera. hello. i am from india and i use nokia asha 502.. i cant find any option to scan qr codes from my phone and hence cant run whatsapp web.. i would be highly gratified if you could help me out..
Glad that it all worked out fine! I am using nokia asha 311. I tried swipe up from bottom but it doesnt work for me. Nokia Asha 311 is also an S40 device so Whatsapp Web is definitely supported. Have you updated your Whatsapp app to the latest version? DreamAccio had a similar problem. what does it mean to swipe up from the bottom? what are the options when you swipe up from down the screen? Please ensure that you have the latest version of Whatsapp and latest version of your S40 operating system. If you have the latest updates, I don’t see why it shouldn’t work. Let me know if you continue to face this issue. my phone is nokia x3-02 when i swipe from bottom of the screen nothing happen.. I do have the latest version of whatsapp.. I understand the steps involved, but I don’t understand what information is actually being exchanged between my phone and my computer when I scan the QR code with my phone. It’s also peculiar in the way it uses my phone internet connection rather than my computer’s. Can you explain further? The most important thing you need to know is that all your chat data is all stored only on your phone and not on any other server accessible via web. Whatsapp Web is simply a terminal to use Whatsapp via your phone. Think of it as a second screen. When you scan the QR Code, you authenticate your account. Then Whatsapp Web pulls your chat data from your phone in real-time. It also sends any message that you add on Whatsapp Web directly to your phone first and then to the recipient. This is why you need your phone to be on as well as with an active internet connection. Your phone is your server and to see your data on Whatsapp Web, you need your server to be active. Given the information you just shared, why is this method better than, say, the method Facebook uses with messages, where the phone app and the web interface access the same “account” and sent messages get synched up as long as there is an active internet connection on both terminals? I’m trying to understand why they didn’t decide to use the web interface on its own once it’s been authenticated, because with this method there seems to be a lot of loop-around communication, web-to-phone followed by phone-to-server, and it’s all being done through the Whatsapp servers if I understand correctly, even if the chat data is not stored on the server itself. 1. Whatsapp is a ‘Mobile-first’ application: Whatsapp started as a mobile application and chose a model where all the data will be stored on the users device. Now when whatsapp decides to add another device (Whatsapp Web), technically the current method (using mobile as a server) is the only way to go about it. From a regulatory point of view, it might be possible that Whatsapp is not allowed to copy the users data from their devices to its web servers without first taking their permission. For Facebook, which started as a web app, having a web server was a necessity. For Facebook, it was much easier to scale to a mobile app using the same servers. 2. Why Mobile Servers are better than Web Servers: I think this is debatable and largely depends on the strategy of the company. For companies that prefer to store data on Mobile (such as Whatsapp), the advantages are privacy of the users and possibly low cost of operations (no cost of maintaining web servers). @scanovatech:disqus : My whatsapp scanner is not able to scan the QR code even when my Whatsapp and Google chrome are updated! Any leads? Can you scan QR Code attached and test if your phone camera can decode this? Please use a standard QR Code scanning application like Scan or i-nigma. Please let me know which device you are using.